Cambodia, Phnom Penh, Nov. 10, 2017 – This year, WWF-Cambodia in collaboration with the Fisheries Administration and the Kratie provincial administration celebrates Fresh Water Dolphin Day on November 10th 2017 in Kratie province, in which it aims to raise awareness of their importance to Cambodia and to celebrate the births of the new calves. The event will further educate the local communities on benefits of the species conservation, the threat of illegal fishing, and how the community can help to reduce the threat, and raise concern over new proposed hydropower dams on Mekong mainstream. Interestingly, the conservation efforts by WWF-Cambodia and partners have resulted in the birth of nine dolphin calves in the past 10 months. Such result shows encouraging signs of further stabilisation of the Mekong Irrawaddy dolphin population. During the last eleven months​​​ of 2017, two dolphins died and nine dolphin births have been recorded. This is a high achievement compared to the numbers in full 2016, in which six dolphins died and eleven were born. More than ever, it is hoped that it is possible to reverse the trend of Mekong Irrawaddy dolphin population decline. During the period, January-October 2017, two dolphins died and now nine dolphin births have been recorded. This is a high achievement compared to the same period last year (January-October 2016), in which four dolphins died and only four were born. The achievement is a positive sign and gives hope and motivation to everyone especially to those who work tirelessly in the field. Mr. Seng Teak, Country Director of WWF-Cambodia said that “WWF-Cambodia in collaboration with Fishery Administration and local authorities will continue our conservation effort in order to get even better results in the future. 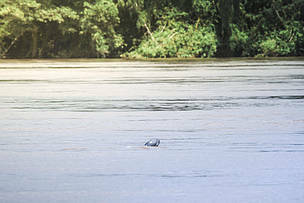 Preserving Mekong Dolphin, which is the national living treasure of Cambodia, is proving benefits to everyone in the long run through ecotourism.” He also added that “conserving Mekong dolphin is like conserving fish stock and other biodiversity in the river which can sustainably benefit to local communities”. “We are dedicated to preserving our Mekong Irrawaddy dolphin, while realizing that economic development is also necessary to improve people’s livelihood and assist the community forestry and fishery groups, through which local community are engaged to protect their natural resources.” said His Excellency Eng Cheasan, Delegate of the Royal Government of Cambodia in charge of Director General of Fisheries Administration of the Ministry of Agriculture Forestry and Fisheries. The major threat to Mekong Irrawaddy Dolphin is illegal fishing practices. New proposed hydropower dams on the Mekong mainstream are also the concern to the future survival of the species. Only 80 critically endangered Mekong Irrawaddy dolphins remain in the Mekong River. The number is very low comparing to that in the last century, in which its population was estimated to be around 3,000 individuals living in Mekong and Tonle Sap River. With this small remaining population, we have been working very hard to conserve the specie through strict law enforcement, reducing and eliminating illegal fishing activities in the protected zones, raising awareness, research and monitoring, and providing alternative livelihood to local communities. Despite all of the negative factors that threaten this species, the vigorous amounts of conservation work and the ‘Fresh Water Dolphin Day Celebration’ this year is a light of hope and inspires all people to preserve this valuable species. To make the event more attractive, participative, and raise the awareness to local people on the event day, there will be a bike ride from Kratie river front to Kampi dolphin viewing site early in the morning of November 10th starting from 7am. After arriving at the site, the participants will be collecting trash along the river bank, in which it is a source of water pollution impacting to the living of the Mekong dolphin. Around 300 participants are expected to attend the event including students, villagers, and representatives from NGO’s, the Fishery Administration, local authorities and others. The most recent calf, captured in October 2017.